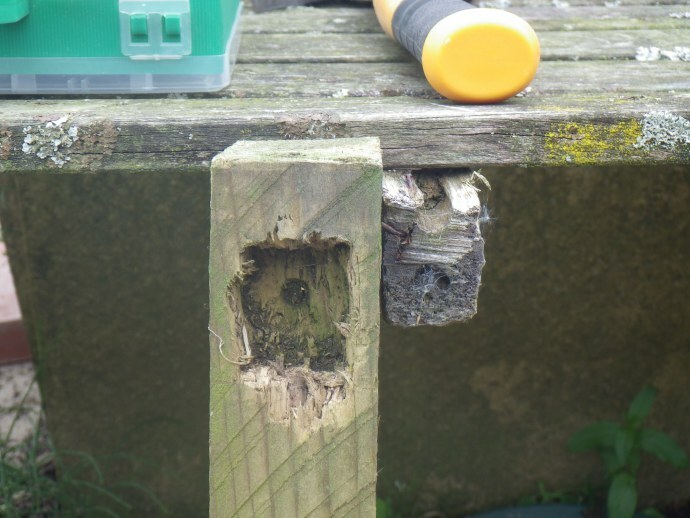 Drilling Holes in Palletgate – that’ll teach it! With still-aching limbs, and an extra hour in bed as we moved to GMT (proper time), I trepidly approached my other task of the weekend – the repair of (cue halloweeny-type scary music) PALLETGATE. Ex-hurricane Gorblimey didn’t only vent its anger on the willow hedge. It also encouraged certain nails in Palletgate’s construction to make various bids for freedom, leaving the gate looking decidedly weak. 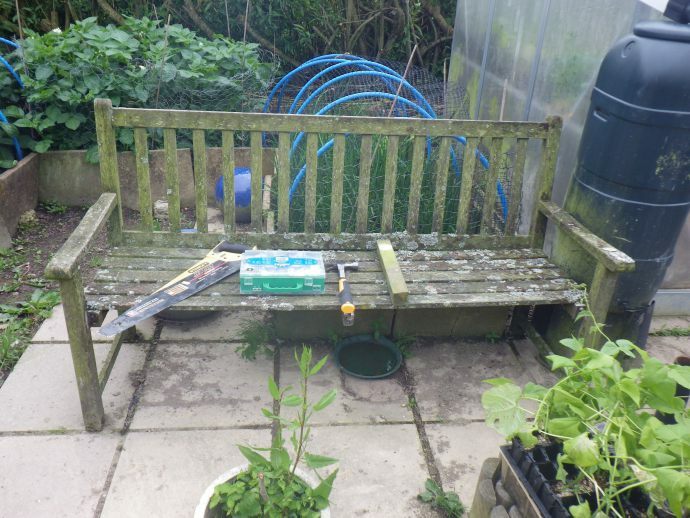 Our old, slightly dangerous Garden Bench…everybody. Good, now we all know one another, we can start. This bench was given to thesnailofhappiness by her parents, probably about 20 years ago. Since then, it has done sterling service in the Welsh weather and, save one treatment with Ballistol pine oil, has had little TLC (Timber Looking-after Care). Mr Snail-of-Happiness has been at it again. 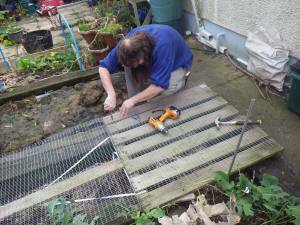 I daren’t venture into the garden when he’s doing DIY-type things – read this and you will understand why. Almost every day after our lunch we take the dogs out for a walk. Sometimes we go to the river, or down to the beach, but usually we do a couple of miles from the house so that we don’t have to use the car (somehow it doesn’t seem right to drive in order to walk!). Going for a walk is good for us – we do at least some exercise every day – and for the dogs – it makes sure Max gets some exercise (have I mentioned that he is half dog-half cushion?) and gives Sam mental stimulation as she has to concentrate in order to walk properly on her lead*. But as well as health benefits, our walks often have an additional yield. 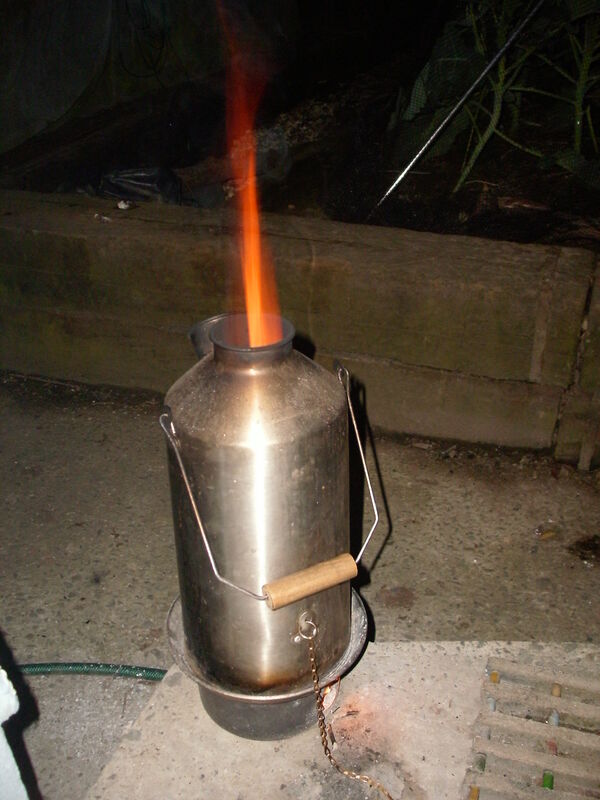 Usually this is just wood for burning in the kelly kettle, but we have come home with other random items: a piece of heavy-duty plastic that I now use as a waterproof mat to felt on; a piece of timber that has been tuned into a support for a shelf; aluminium cans to be recycled; a plastic spatula (as described in my 21st Century Womble post); some soapwort cuttings; some forked twigs to make into hooks for towels and yesterday, a pallet. This last item was not our usual find by the side of the road, but been propped up outside a house. We had seen it a few days before, but yesterday there was someone in the driveway constructing a new fence. Mr Snail-of-happiness decided that it was worth a try and asked if we could have the pallet. It was willingly given, so I walked the dogs home and Mr S-o-h carried a pallet. This is a particularly good result as we are currently collecting the things for some garden constructions. 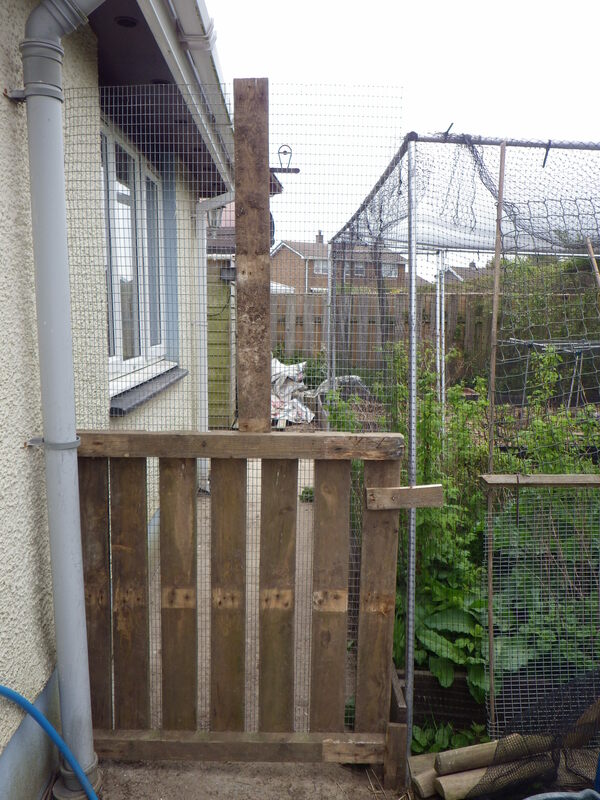 We have already used two (from the local builders’ merchants) to raise the IBC up to give a better head of water, and we would like to use a few to make a gate and some barriers to keep the chickens in the vegetable-free end of the garden. 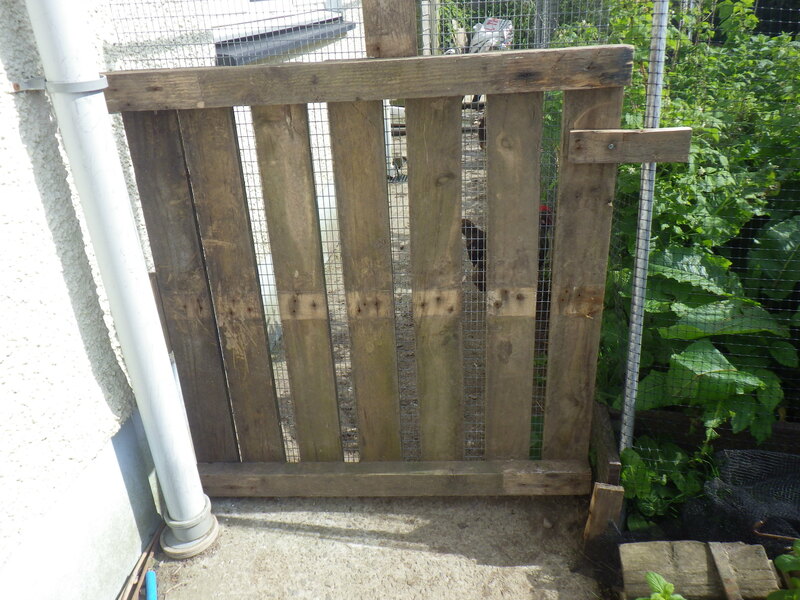 Pallets are a high-value commodity for those of us who like to make use of ‘waste’. If you don’t believe me, check out Unconsumption to see some of the amazing creations that people have come up with. I don’t think that we’re quite this creative, but we are really looking forward to making use of this great free resource. So, tomorrow we will walk the dogs again… perhaps we will just get some exercise, perhaps we’ll meet friends and have a chat, but perhaps we’ll come back with a treasure!